Robert Weaver was born in Stilwell, Kansas in 1935. He received his BA from the Kansas City Art Institute, his BFA from the University of New Mexico in 1965, and his MFA from the University of Nebraska at Lincoln in 1968. 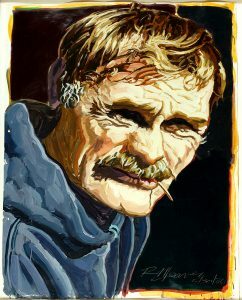 Weaver is known for his highly expressionistic portraits including those of Bob Devaney, Ernst Lied, and Norman Geske. His oils and lithographs capture the true personality of the subject; even though some appear quite ugly, each is truly meaningful.